This was a time exposure looking south from 1460 Macombs Road. Morrisania Hospital and Yankee Stadium are in the distance. 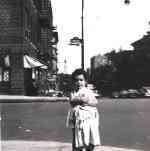 This is a photo taken by my father Charles Mannino in the 1940's of the corner of Southern Boulevard and Fordham Road. He took the photo from the Bronx Zoo's sidewalk. Note the wonderful old lamp posts and the flags flying in both pictures. 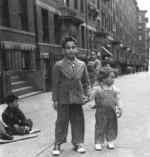 This photo was taken in the 1940's by my father, Charles Mannino, of the playground at 183rd Street and Hughes Avenue where we three children played most of the time. This photo was taken from the Gun Hill Road station at White Plains Road. 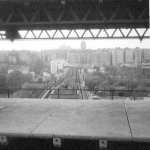 It shows the Third Avenue El as it headed down Gun Hill Road towards Webster Avenue where it would produce the famous "squeal" as it turned onto Webster. This photo was taken sometime in 1959. This is the 3rd Ave El, heading north, coming up to the 204th Street Station. This picture was taken on Easter Sunday, April 1968, on the block where I lived, Sedgwick Avenue. My friend Jack and I are in front of my house and in the background is the Bronx VA Hospital. This was the original VA building; years later taller buildings were added and now the original, if it still stands, is all but obsured from the street. Many times the patients would walk the grounds and come down the embankment to the gates and ask for cigarettes. This is a photo of me taken when I was two years old in 1953. It was taken where I lived on Vyse Avenue in the Bronx. My grandparents owned a candy store in the area. This is a view of the east side of Findlay Avenue between 167th and 166th Streets, looking south. Based on my brother's and pouting sister's appearances, I guess this was taken about 1947 or so. This image provides a fairly good view of the attached apartment houses prevalent in this neighborhood, most of which were built in the 1920s. Behind my brother is the quintessential stoop, perfect for Stoop-Ball, (or Off-the-Point, which we Findlay denizens called it in the fifties). This was Frisby Avenue looking torwards St. Peters Avenue. Editor's Note: Based on the car behind the one in the foreground, my guess is that this picture was taken in the 1940s. Benjamin Motta adds: It is facing Overing Street. In fact, the first two cars parked are parked right in front of the walk-in apartment where I lived as a four-year-old boy on Frisby Avenue. I know it is facing Overing Street because directly behind the walk-in apartment is the archway that leads into the courtyard of the building. The other side of the street did not have this type of building. There was one small apartment house with no courtyard. There was also a beer garden right next to it, and a great big empty lot with a hill for sleigh-riding. These were the attached houses that some of our "a-hundred-fifty-niners" grew up in. (Hans, Rogers, Tracey, Young, Pielack, Doyle, Bready, Sach, Murphy, Zempski, Pachowski etc.) 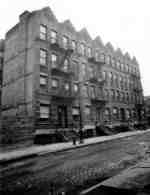 They were 413, 415, 417, and 421 on East 159th Street between Melrose and Elton Avenues. Nobody knew why there was never a 419.